“Athena is a fantastic groomer. Her calm and assertive nature makes my dog stress free in her hands. She is always looking at ways to improve her grooming skills. She has traveled to Taiwan and the US to learn advanced new grooming techniques and dog handling. The most challenging jobs were the ones that she seemed to enjoy and her passion for perfection became obvious. Athena is a compassionate person, trustworthy beyond fault and also a good friend. I am thrilled she has taken this love of dogs and grooming and turned it into a business and I wish her great success. I don’t hesitate to recommend her to anyone when it comes to handling dogs and doing an outstanding job. My recommendation for Yi Ping Lu for grooming comes with the highest level of consideration. I had the pleasure of training “Athena” in the art of dog grooming.She learned at an amazing rate, one that is unequaled until now.Her conscientious style and attention to detail makes her a valued addition to any grooming establishment.She presents a lovely, clean look that is consistent from one dog to another…. 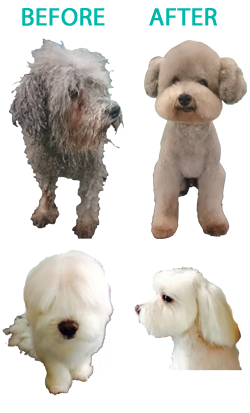 She accomplished learning many breeds with excellence including: Poodles, Schnauzers, Yorkshire terriers, Shih Tzu, Lhasa, Golden Retrievers,Havenese,Bichons, and all those long haired large breeds, Collies, Malamute, Shelties and all the small mixed breeds. Her diligent service to the animal is one that is firm but gentle, she treats them with the utmost respect without being intimidated. She can handle anything.